October 2012 : Beginning of the thesis of Amandine Garcia on the topic “Observation and modeling of dunes on Titan. Link to Climate”. Co-direction between S. Rodriguez (AIM, Université Paris Diderot) and S. Courrech Bridge (MSC, Université Paris Diderot), MENRT funding. End of May 2012 : We just learned that our EXODUNES ANR project is funded (PI: S. Rodriguez, C. and S. Narteau Courrech Bridge). Beginning 1st January 2013. Titan, Saturn’s satellite, is the second largest satellite of the solar system and the only one to possess a dense atmosphere and an active climatology. Its huge interest triggers the Cassini-Huygens mission. The VIMS into infrared wavelength and the RADAR instrument in SAR mode, onboard the Cassini orbiter, are able to observe Titan’s surface. 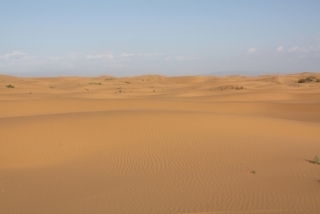 My work is to study dunes, a particular geomorphological unit strongly linked with the climate. RADAR/SAR global mapping reveals the presence of large areas of linear dunes, all confined to Titan’s equatorial regions (30°N – 30°S). 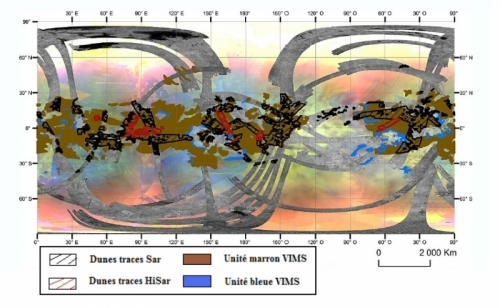 Gathering the spectral heterogeneity of terrains given by VIMS and the location of the dunes imaged by the RADAR/SAR, we can give the total area covered by Titan’s dune fields around the whole equatorial region (22% of the surface of Titan, i.e. ~18 000 000 km2). They are an important memory of past and actual Titan’s climate. It is in particular possible to constrain the surface winds over the dunes by looking more locally how dunes react (converge/diverge) around obstacle. This behavior is directly linked to the wind regime and the obstacle’s geometry. To better understand this we decide to reproduce millimeter dunes in laboratory experiment applying winds surface predicted by the climate model in order to study their behavior around obstacle setting at Titan scale. The order magnitude of the aspect ratio between the height of the dunes and the height of the obstacle of ~1/6 that we infer from the RADAR/SAR data analysis (radarclinometry), allows to put in scale for laboratory experiments. The main result of these experiments shows an inconsistent with the SAR observations by the appearance in the experiments of two erosion zones while we expected a solely long erosion zone. It puts into question the validity of the winds predicted by the climate model. However, it is still a work in progress and we need to gather more observations, experiments and numerical simulations to better understand the morphogenesis of Titan’s dunes and to better constrain Titan’s climate. WithinCAREERI(ColdandAridRegionsEnvironmentaland EngineeringResearch Institute), ProfessorDongZhibaois the executive directorof the laboratoryof Deserts andDesertification.ZhibaoDongis specialistof aeolian transportanddunemorphodynamics.His workin the field and with wind tunnelmake hima world expert onthe geomorphology ofarid areas.The purpose ofhis visitwas to combineobservations tonumerical modeling andexperimental studies conductedinDiderotParis(IPGP, MSCandAIM).Itwill incorporate manyprojects (BQR, LIA,ANR).In particular, itwill providestrongobservational constraintson theclimatic and environmental conditionsresponsible forthe formation of cohesive dunes observed in China. Figure : Professor Dong Zhibao explaining these students dune formation on the experimental site Shapotu (Ningxia province, China). The measures include in-situ meteorological data (see wind measurement tower on the left), topography measurements and sediment fluxes. Our project ondune formationand climateon Titanfitsnowin the newInternational LaboratorycombinesSALADYN.This laboratorywill develop theinteractionsbetween Franceand China onall issuesof sediment transportandlandscape dynamicsin thedesertenvironmentin Central Asia. Figure : Cohesive “salty” dunes in the Quadaim Basin (Qinghai, China), potential analogues to Titan dunes made of sticky organics. 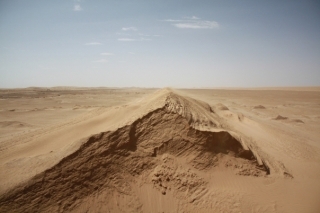 The photo is taken facing the prevailing wind along the linear structure of the dune. The orientation of the dunes and induration of different sedimentary layers remain unexplained. PingLvobtaineda PhDinCAREERI(ColdandAridRegionsEnvironmentaland EngineeringResearch Institute)for her workonwind erosionand movement ofsandsubjected to flow shear.In collaborationwith the laboratory ofgeomorphologyat IPGP,she obtained apost-doctoral fellowship from Mairie de Paris(2011-2012) anda grant from theAcademy of Sciences ofChina to work onthe instability originating in the formation ofdunes.His workis basedprimarilyonin-situ measurementsof dune morphogenesis atlarge scale (~ 100 m)performed on theexperimental siteShapotu(Ningxia province, China). Figure : Linear dunes newly formed on the experimental site Shapotu (Ningxia province, China). The picture is taken in the direction of the main wind moving towards the south-east. Such a wind is mainly due to the temperature difference between the semi-desert of Inner Mongolia and wetlands of eastern China.